While watching Fixer Upper tonight, I started clicking around and pinning all the things on Pinterest. Anyways, sometimes you're doing some pinning and you see something that smacks you across the face. 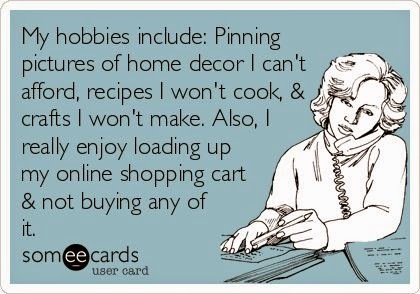 I mean, it had me pegged already, and then the part about the online shopping carts?! Y'ALL. I put things in shopping carts all the day long. I KNOW I'm not going to actually buy it. There are 6 things in my Amazon cart right now and 4 things in my Zulily cart. As we are preparing for our move, I've even put things in a Pottery Barn cart and I know good and well that that ain't happenin' right now. Are there any psychologists that read this blog? What does that say about me? What is my issue? Why do I put things in a cart and never buy it? It's a sickness. I'm certain. I think we ALL do this. We get this impression that "everyone else who pins this DIY is going to get it done this week and it is going to be flawless", when in reality, I'd wager 90% of us are just sharing pics of "Wouldn't That Be Nice, But Get Real, My Kid Is Trying To Eat A Crayon Right Now". I'm not a huge pinner, but I am a BIG put-it-in-my-online-shopping-cart-and-never-buy-it person. And I'm definitely NOT a psychologist, but I read an article a couple years ago that said putting things in your online shopping cart and then waiting (i.e. not buying them, or at least not buying them right away), can actually release the same endorphins as those that are released when you do actually buy the product(s). The article was basically saying, "Hey, go for it! It'll make you feel good and won't cost you money!" Haha, hope that helps! 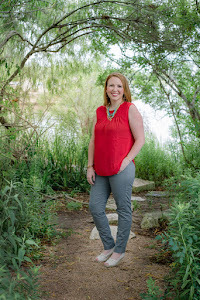 Love this blog, Jenny! That is an excellent idea! Cause I've had several hits but also several misses, especially where food is concerned! Jenn - that makes total sense. I think I like to cart it because I kinda feel like I'm shopping and picking something out... while not actually purchasing. Cause, let's face it- if I actually purchased everything I carted... I'd be absolutely broke :) Thanks for reading!